I’M ALWAYS INTRIGUED by dogs hanging their heads out vehicle windows. Do they delight in the wind blowing through their fur? Or are they simply enjoying the warmth of the day, the carefree joy akin to riding with the convertible top down? Photographed through the windshield of our van late Saturday afternoon along Minnesota State Highway 3 in Northfield, Minnesota. The Zemans’ farmhouse and yard, this view looking toward the driveway. SIBLINGS KATHY AND NICK ZEMAN farm the old-fashioned way. Visitors park along the county road by Simple Harvest Organic Farm on 155th Street East, rural Nerstand, for the recent Eat Local Farm Tour. Their 20-acre rural Nerstrand acreage is home to an assortment of animals typical of farms of yesteryear. Chickens, ducks, geese, turkeys, pigs, goats, cows and rabbits along with two dogs and bees comprise the collection of critters I spotted on a recent visit. Livestock graze in pastures and are fed a vegetarian diet. These animals see sunlight and sky on this organic farm. Simple Harvest Organic Farm was among sites featured on the recent 2016 Eat Local Farm Tour. As I hiked up the driveway toward the farm yard, I noticed the absence of a barn. I didn’t ask Kathy about that. I was distracted by the goats and then the chickens peering from behind chicken wire in the weathered chicken house. Then it was on to the rabbits and the sweet bunnies and a single milk goat that preferred chomping on dry leaves over fresh leaves. As I circled the property, I noticed plenty of weeds and droppings from wandering geese. This isn’t a pristine picture perfect farm. But it’s lovely in the sort of way that this is a way of life for Kathy and her brother. Not only do they raise food for themselves, but also for others through their Community Supported Agriculture business. This weathered building houses the chickens, who roam inside and out. This pair peered through chicken wire in a chicken coop window opening. The farm store is located in a an enclosed corner room of the pole shed which also houses pigs and fowl. On the second Saturday of every month, from 10 a.m. – 4 p.m., the Zemans open their farm store—housed in a room in a pole shed—to CSA and other customers who stop by to pick up frozen whole chickens, eggs and more. The farm is also open by appointment. As I chatted with Kathy, whom I met 30-plus years ago when I was a newspaper reporter and she the Steele County dairy princess, she paused to greet new arrivals. “The neighbors are here,” she enthused. And they really were her neighbors, their bikes leaning against a fence near the end of the farm driveway. Simple Harvest raw honey available for purchase at the farm. Friendliness and old-fashioned neighborliness prevail here on Simple Harvest Organic Farm. On the day I visited, these items were available for purchase from Simple Harvest. I photographed this sunflower by the chicken coop. Customers could also purchase Wildflower Honey from Schoolhouse Apiary, Northfield, during the farm tour. FYI: Check back as I take you several miles away to Shepherd’s Way Farms, also on the 2016 Eat Local Farm Tour. I grew up on a dairy farm and am always excited to see calves. WITH SUMMER OFFICIALLY on the calendar, it’s the perfect time to take the kids or grandkids to the zoo. For many Minnesotans, that most likely would be the Minnesota Zoo or Como Park Zoo. Just a small section of the Farm, which includes two barns and a shelter available for rent, right. But I’ve discovered a much smaller rural-themed zoo in Greater Minnesota that impresses me. And, bonus, no metro traffic or pressing crowds. Welcome to Sibley Farm at Sibley Park in Mankato. I’ve posted previously about this southern Minnesota zoo. But now seems a good time to showcase it again during peak season. Kids can climb aboard this tractor and another on the adjoining agriculturally-themed playground. I last visited Sibley Farm on a cold and windy day in mid-May with minimal time to explore. Even with less than ideal weather, families were there enjoying the baby and other farm animals and the farm-themed playground. The sheep were snuggling on the spring day I visited Sibley Farm. It is the full-on rural aspect of this zoo which most appeals to me. Most families are so far removed from farm life today that they need this indirect exposure. Even kids who live in the country. Even those who live in Mankato, right in the heart of Minnesota farm land. Sibley Farm provides a place to connect with and learn about farm life. It also preserves Minnesota’s rural heritage. That’s important. My own three grown kids are only a generation removed from the farm. Yet, their knowledge of farming is limited. It’s important to me that they recognize and value the rural heritage that shaped the Kletscher and Helbling families. I expect many farm-raised parents and grandparents feel the same. Sibley Farm is a great place to learn about farming in a fun and interactive way. Sibley Farm includes a water feature complete with goldfish. Tell me, what’s your favorite zoo and why? FYI: Sibley Farm is located at 900 Mound Avenue, Mankato, within Sibley Park and is open from 6:30 a.m. – 10:30 p.m. daily mid-spring through early fall. Admission is free. Besides the farm, Sibley Park offers softball fields, tennis courts, walking trails, lovely gardens, fishing, a winter sliding hill, poetry and more. Click here to read my previous post about Sibley Farm. And click here to read a story about Sibley Park. I GREW UP ON A DAIRY and crop farm where cats and dogs roamed the property. Although they were pets, they weren’t really pets. Rather, they were there to work. The cats caught mice. The dogs alerted us to wild animals and vehicles arriving in the farm yard. My parents never bought cat or dog food. Table scraps, of which there were few from our family of eight, and a daily hub cap of milk warm from the cow nourished the cats and dogs. 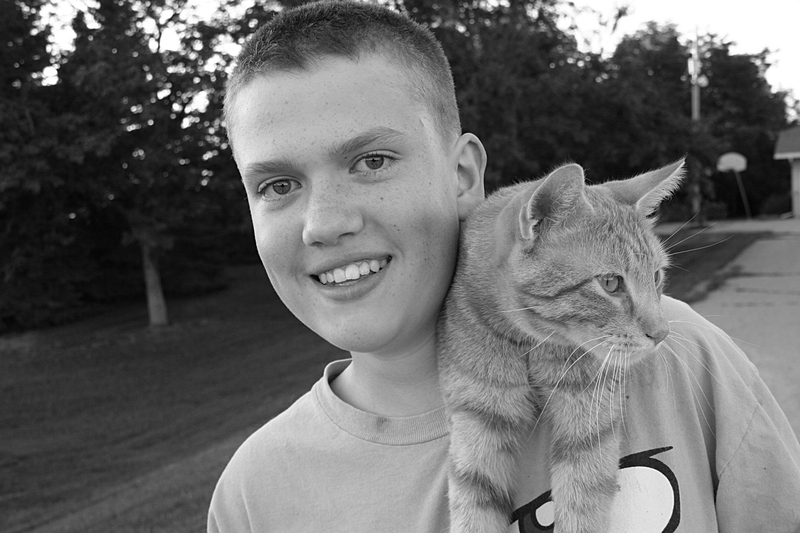 One of my all-time favorite portraits shows Ian, my blogger friend Gretchen’s son, with the family cat, Zephyr. Minnesota Prairie Roots file photo shot in July 2013. I recall dressing kittens in doll clothes and pushing them in a doll buggy. There were endless attempts to teach the dogs to shake hands and fetch balls or sticks. Spring always brought a search in the hay loft or haystack for newborn kittens. Yes, my memories of felines and canines are mostly pleasant ones of working farm animals that sometimes allowed us to play with them. As an adult, considering the cost and care, I’ve never wanted a pet. Plus, I’m just not the type of person who wants an animal living indoors and/or in town. I know I’m in the minority. But that’s OK. I’ll just admire and pet other people’s pets. Titan, so active I struggled to photograph him. 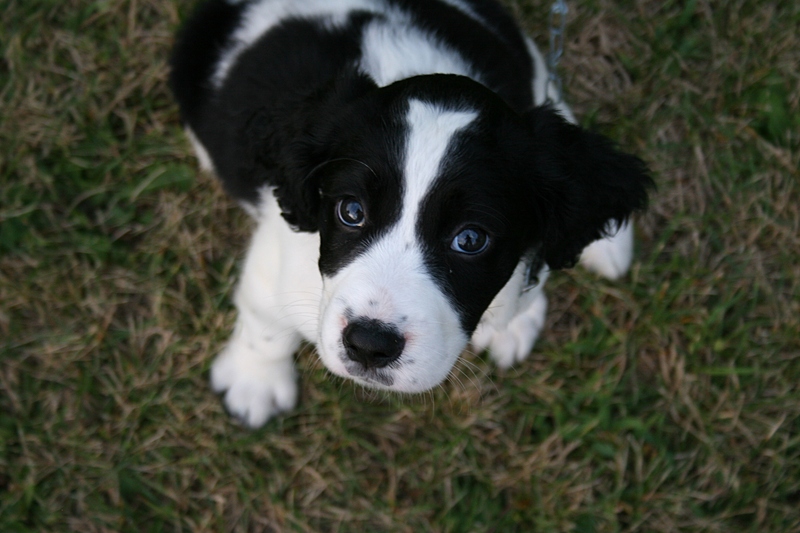 The other night I met Titan, an adorable seven-week-old puppy, at the Spitzack farm outside Faribault. Puppies are so darned cute. Titan reminded me of the story my mom shared awhile ago. One recent afternoon a man from a nearby town arrived at the senior complex where she lives with nearly a dozen puppies for residents to pet and cuddle. He’d engaged the litter in active play so they’d be worn out. His strategy worked. Mom was so excited about a sweet, cuddly puppy falling asleep in her lap that you’d have thought she won the lottery. Pets possess the power to comfort and heal and lift spirits. 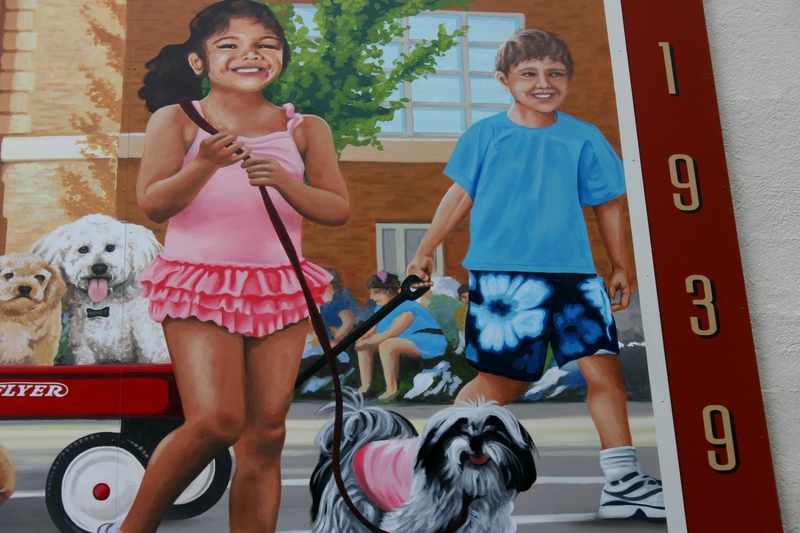 This image shows a portion of the Pet Parade mural gracing the side of the historic bandshell in Faribault’s Central Park. This evening, my community of Faribault holds its 78th annual Pet Parade beginning at 7 p.m. I can’t attend. But be assured, if you’re there, you’ll view plenty of cuddly cuteness. DO YOU OWN A PET or have a favorite pet memory? Feel free to share. NO, THIS IS NOT one of those “Why did the chicken squirrel cross the road?” joke stories. 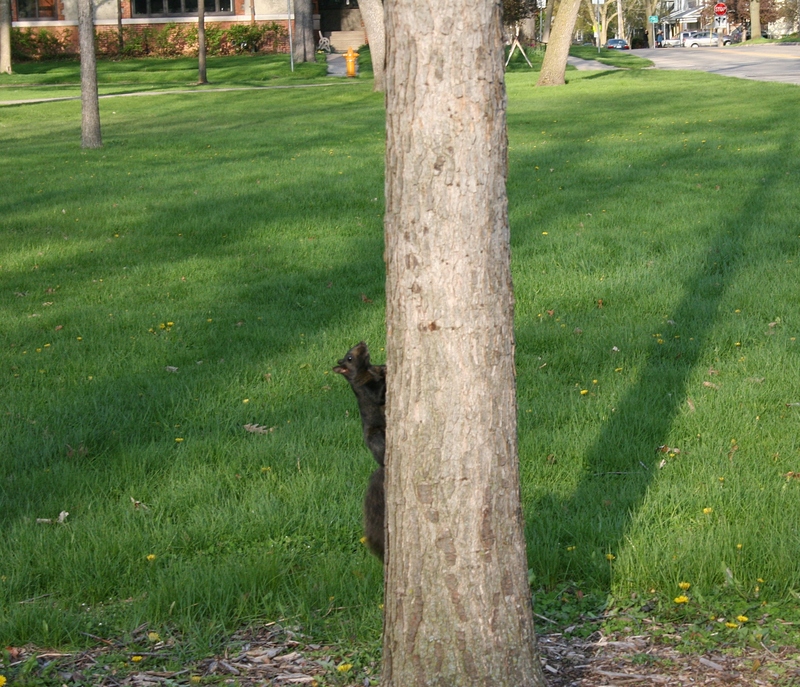 Rather, I am wondering, have you ever seen a black squirrel? I manage to get a bit closer to squirrel number two. I hadn’t until last weekend while at City Park in downtown Appleton, Wisconsin. My second daughter, who attended college in western Wisconsin and now lives on the eastern side of the state, couldn’t believe I’d never, in nearly 60 years of life, seen anything but grey or red squirrels. 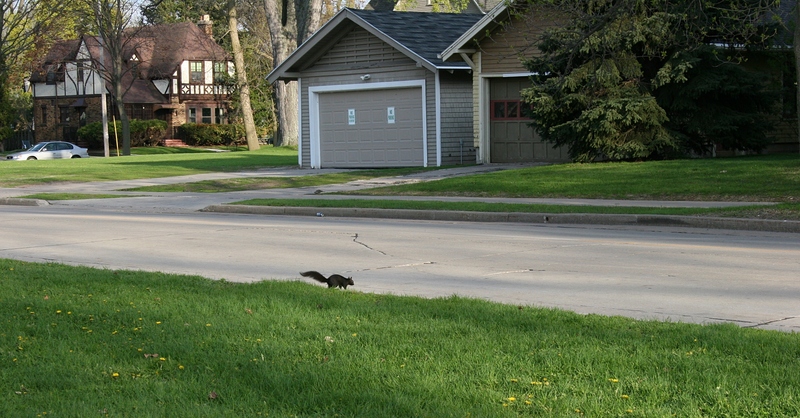 My husband also had never spotted a black squirrel although he once saw an albino in the woods on his central Minnesota childhood farm home. There are plenty of trees in Appleton’s City Park, where I snapped one quick shot before the squirrel scooted out of camera range. I don’t recall any squirrels on my native southwestern Minnesota prairie farm while growing up. Maybe the shortage of trees had something to do with their absence. 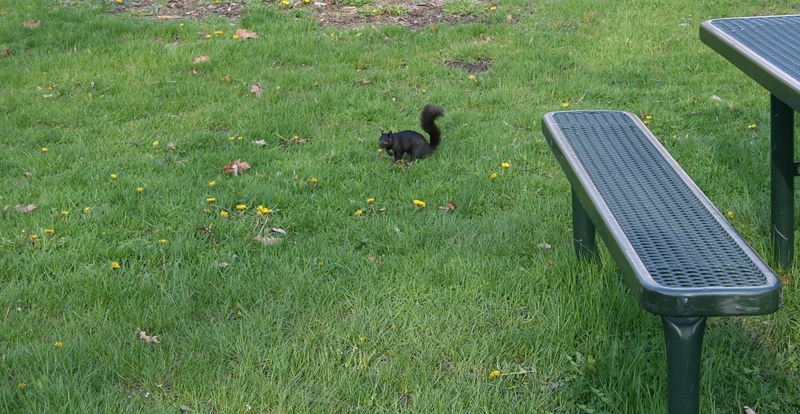 In any case, I was intrigued by the two black squirrels in City Park. My daughter found my interest rather amusing. Sometimes it just doesn’t take much to entertain me.